On Friday November 30th at Chapel Arts Centre Lower Borough Walls Bath BA1 1QR The Blowout Sax Schools of Bath and Bristol will be playing live on stage in an inspired evening of music. 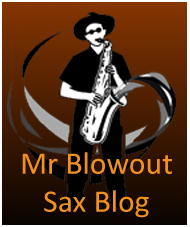 Check out www.youtube the blowout sax channel for previous inspired performances of many classic pop jazz and reggae tunes as well as some you may not know. Tickets are £10 and anyone who is interested in playing the sax is invited to come and see what we are about as anyone can learn the blowout sax way. It will be as always a brilliant and uplifting evening and we are hoping as always for a full house of friends families and saxophonists all cheering each other on while experiencing the buzz of playing live on stage. With Thanks to Mr John Heenan for his usual excellent and comprehensive research. 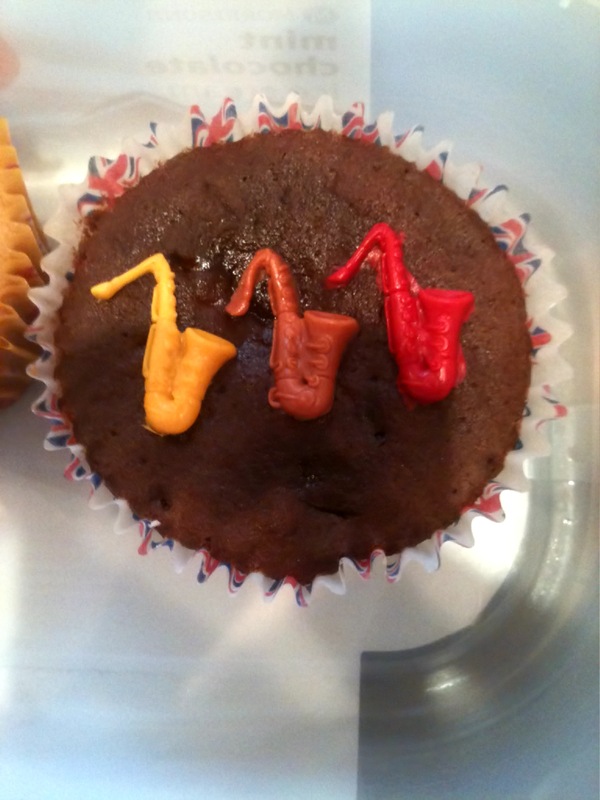 Hand Made Saxophone Cake For Blowout Sax Teach! What a lovely gift for teach made by the lovely ladies from the Rook clan!!Delicious! then Nicki told me about the cake she baked for her son Sky! 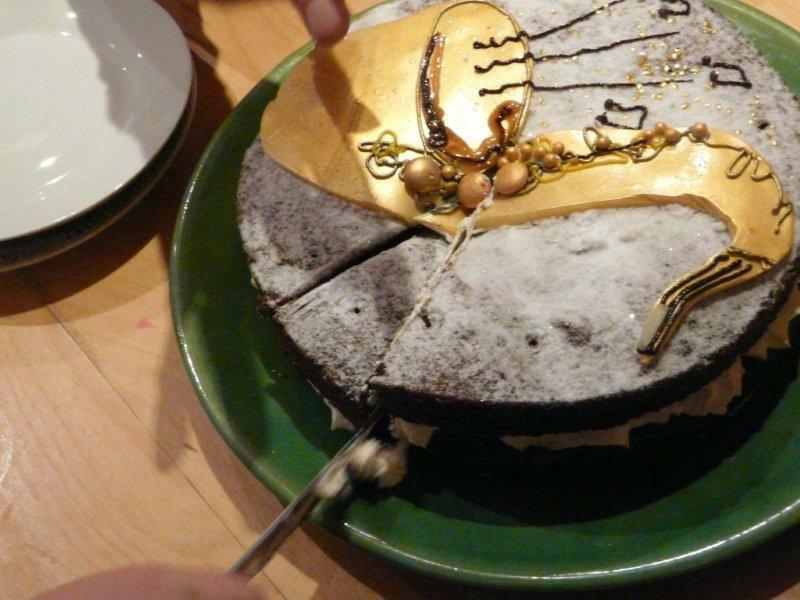 Any more wonderous saxophone cake creations?? A lot of people in the world are inspired by hearing and seeing buskers. 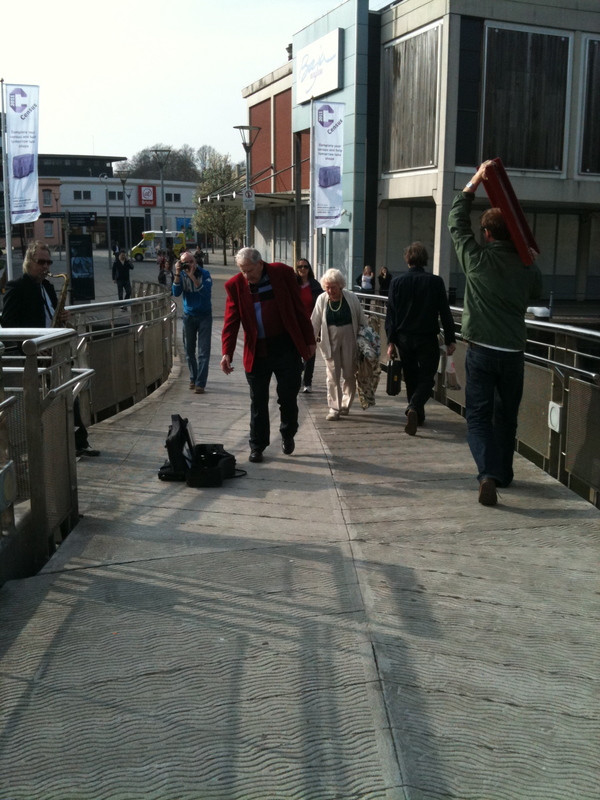 Here’s a saxman playing in Bristol by the Harbourside on the lovely bridge that crosses towards The Arnolfini. 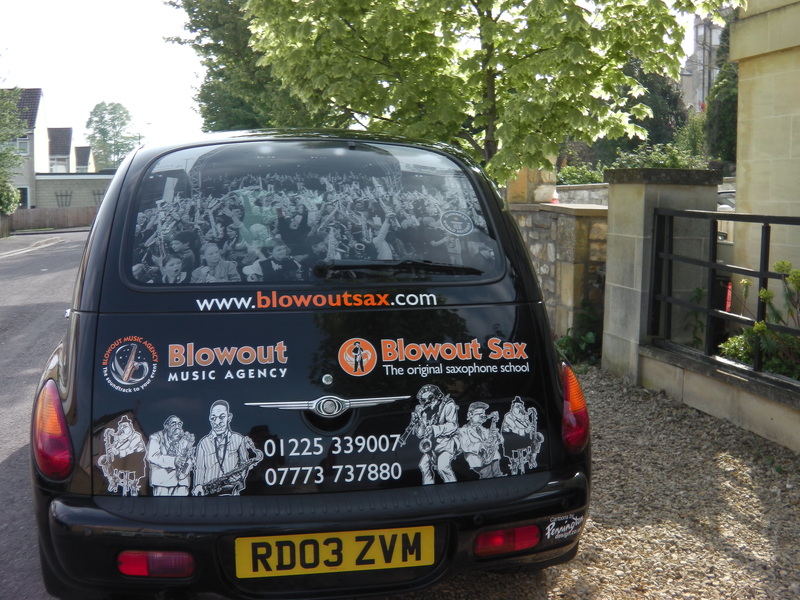 The main sax busker in Bath is one Ben Ross taught at Blowout Sax by Craig Crofton who was initially funded by The Ben Bailey Foundation. 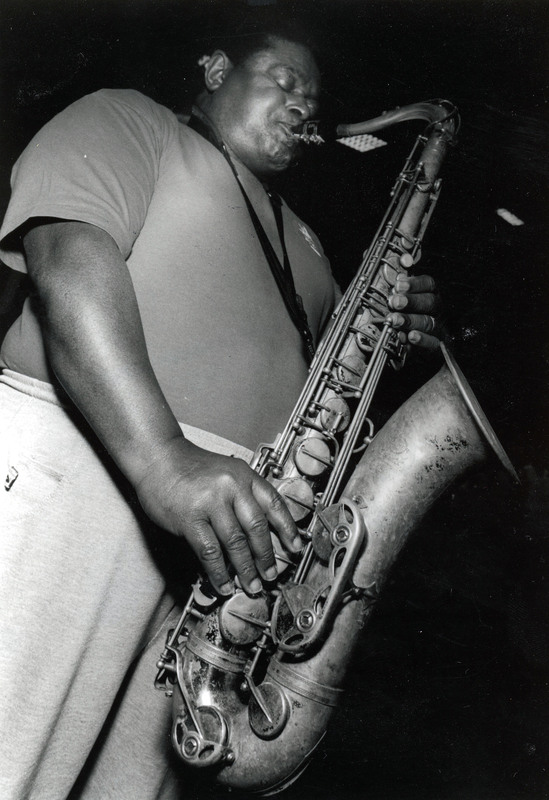 In Bath for many years we had the late great George M’Boussa from Africa who was blessed with the most beautiful tone..he would sometimes play one goregous phrase then admire it bouncing off the buildings before blowing the delectable set of notes. When I first got to Bath in the very late 80s there was a natty zoot suited smooth sax player Johnny Hooper who cleverly for then sold his cassettes and was making huge dollar.He was last heard by a Blowout Sax student running a bar in Portugal and still busking too? Who have you heard in the streets that has sent you tingling? Send us photos from wherever you have seen and heard ace saxmen in the world? Two familiar faces on Bath’s music scene are joining forces to bring more noise to The Rec this season. Bath Rugby supporters Mark Archer and Robbie Verrecchia, who both lead bands in the city, believe more needs to be done to turn up the volume at The Rec. Brass musician Mark, of Blowout Sax music school, approached Robbie after hearing him play samba beats in the city. He suggested they unite to provide a band that would ensure the home crowd stayed in good cheer throughout games. They envisage drum-driven accompaniment to some of Bath’s traditional chants. 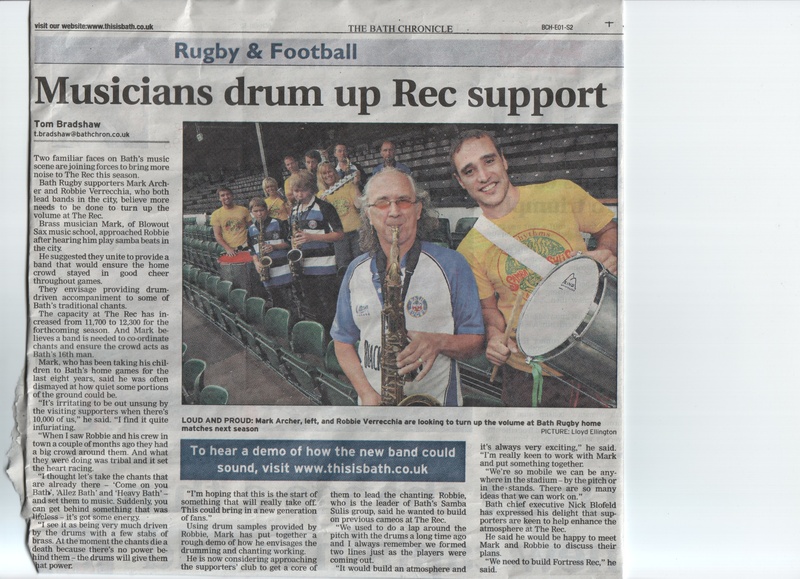 And Mark believes a band is needed to co-ordinate chants and ensure the crowd acts as Bath’s 16th man. Mark, who has been taking his children to Bath’s home games for the last eight years, said he was often dismayed at how quiet some portions of the ground could be. “It’s irritating to be out unsung by the visiting supporters when there’s 10,000 of us,” he said. “I find it quite infuriating. “When I saw Robbie and his crew in town a couple of months ago they had a big crowd around them. And what they were doing was tribal and it set the heart racing. “I thought let’s take the chants that are already there – ‘Come on you Bath’, ‘Allez Bath’ and ‘Heavy Bath’ – and set them to music. Suddenly, you can get behind something that was lifeless – it’s got some energy. “I see it as being very much driven by the drums with a few stabs of brass. At the moment the chants die a death because there’s no power behind them – the drums will give them that power. He is now considering approaching the supporters’ club to get a core of them to lead the chanting. 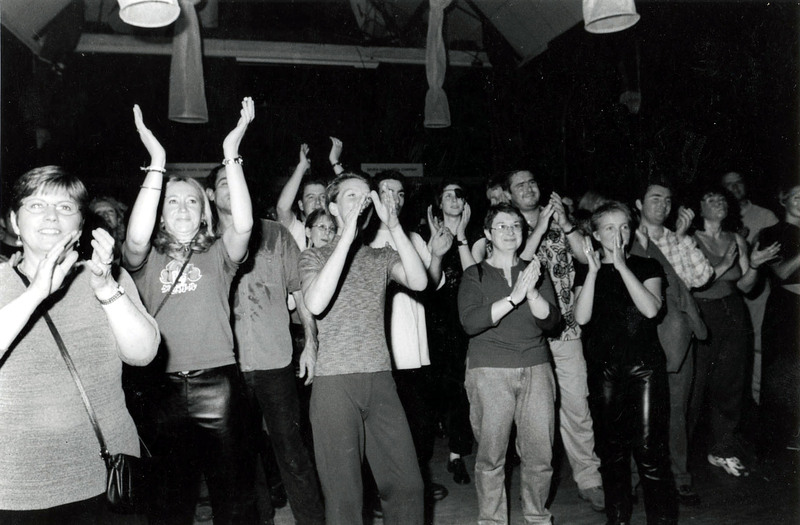 Robbie, who is the leader of Bath’s Samba Sulis group, said he wanted to build on previous cameos at The Rec. “We used to do a lap around the pitch with the drums a long time ago and I always remember we formed two lines just as the players were coming out. “It would build an atmosphere and it’s always very exciting,” he said. “I’m really keen to work with Mark and put something together. Bath chief executive Nick Blofeld has expressed his delight that supporters are keen to help enhance the atmosphere at The Rec. He said he would be happy to meet Mark and Robbie to discuss their plans. “We need to build Fortress Rec,” he said. 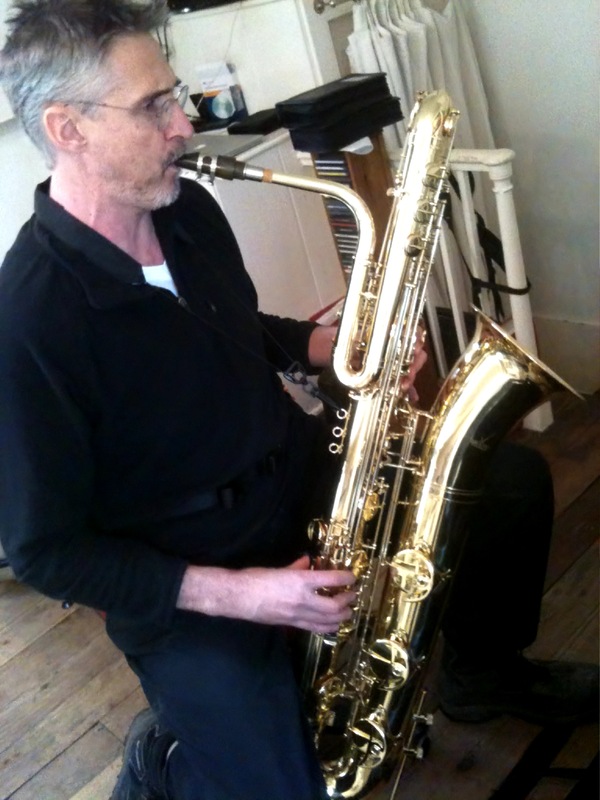 We are still in negoatiations with Bath so watch this space..
Will Heath ace BariSaxman has just bought a Bass saxophone from www.sax.co.uk.Anyone out there with the art of bass saxophone please come forward?? 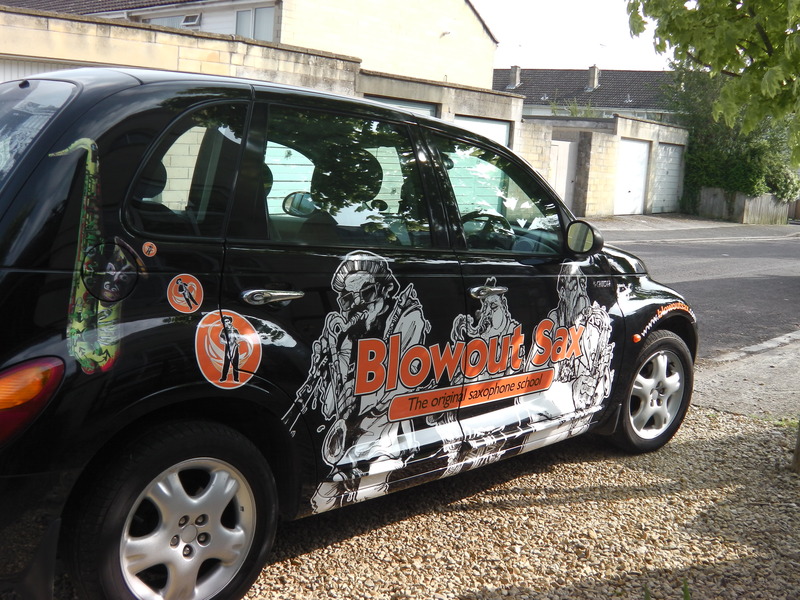 The Return Of The Blowout Saxmobile 2012. 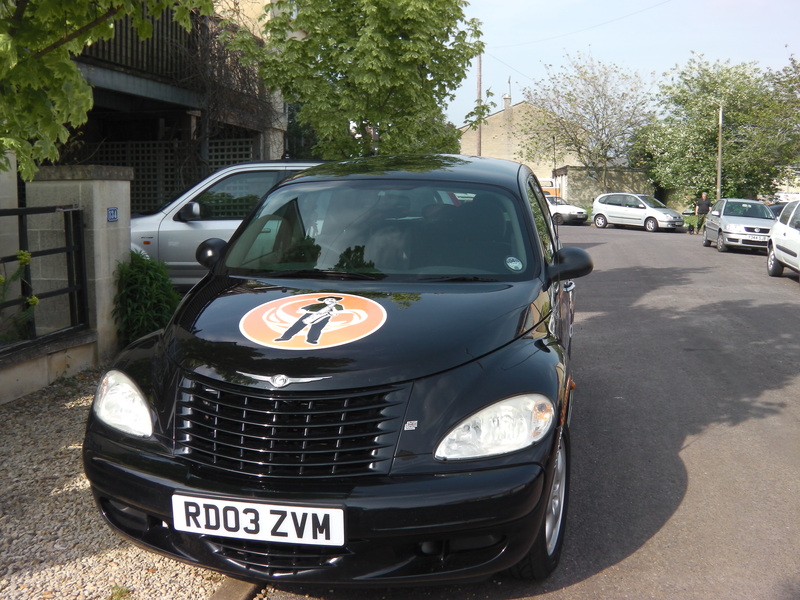 Many many years ago a funky jazz Saxmobile pottered around Bath resplendid of cartoon images of Charlie Parker, Ronnie Scott and Miles Davis. Then one very sad day as it tottered on the brink of exhaustion some wags stole it!!!! 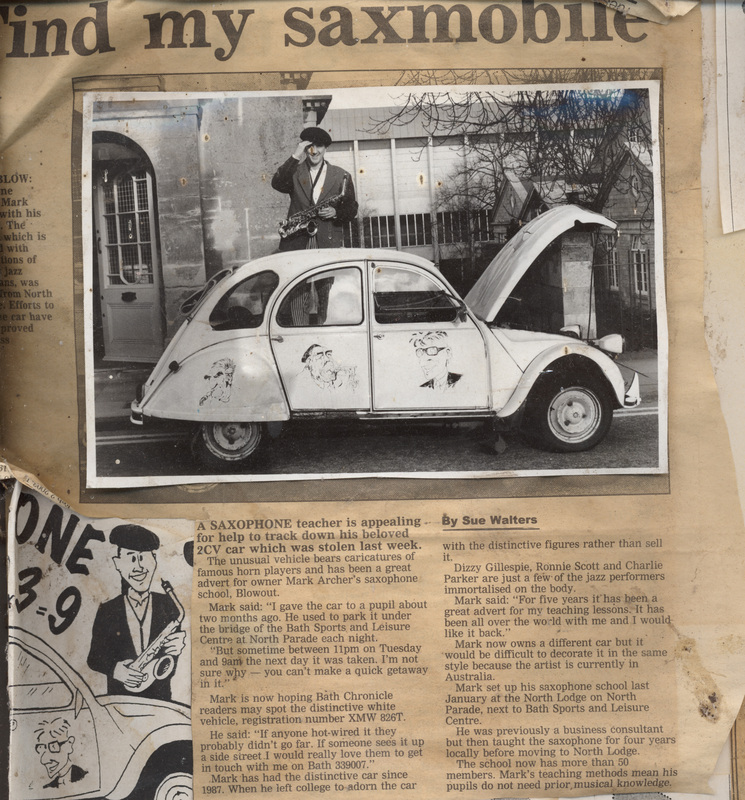 and the Bath Evening Chronicle wrote this article:~’Find my saxmobile.’The original artwork was copied by a Doctor friend from an album cover using a brush with 2 hairs and bitumen paint! There then followed a slightly embarrassing call from the Bath Evening Chronicle Staff Member Jack Pennington who declared that he was the originator of the cartoons and was well known for his work at Ronnie Scotts and the UK jazz scene. So ‘paying price of sax appeal’ which resulted in a musical meeting between Mark Archer teaching Jack the sax as belated payment of his images! Now some 16 years later with a new revamped website www.blowoutsax.com designed and completed to be of interest for all current saxophonists of all standards, beginners, intermediaries and advanced, wannabe saxophonists and people who simply love the saxophone Mark fulfilled a long held ambition and has recreated a new Saxmobile to help publicize Bath’s very own Blowout Sax School. and on firm condition that this time Pennington’s design was clearly displayed, on the driver’s side are the Jack Pennington cartoons of many of the saxophone greats like Charlie Parker, John Coltrane,Ben Webster and Roland Kirk. And on the back is The Big Blowout when The Blowout Sax smashed the Guinness world record for the world’s biggest ensemble in 2004 at the Royal Crescent with the majority of players being Blowout Sax School taught. 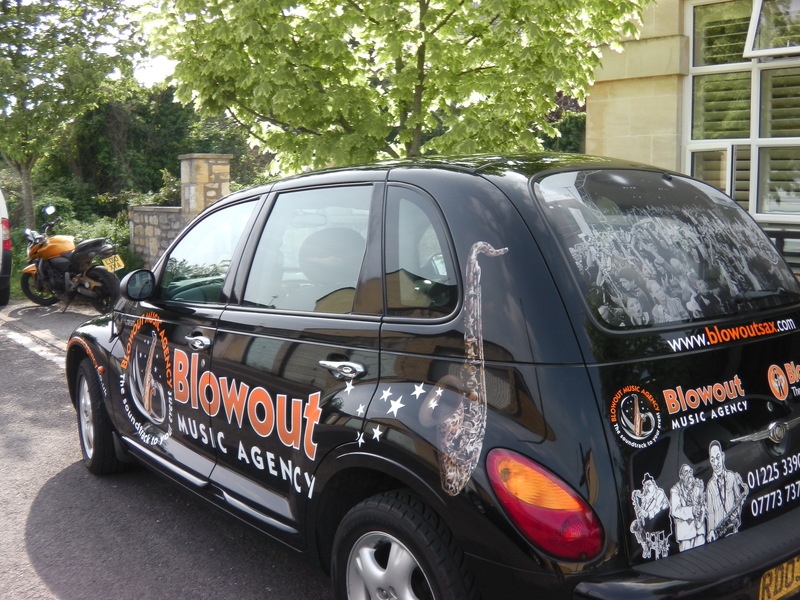 The Passenger side displays the brand new Blowout Music Agency with its aim is to provide the soundtrack to your event with the spine-tingling sounds of the saxophone as the core of each fantastic professional act. 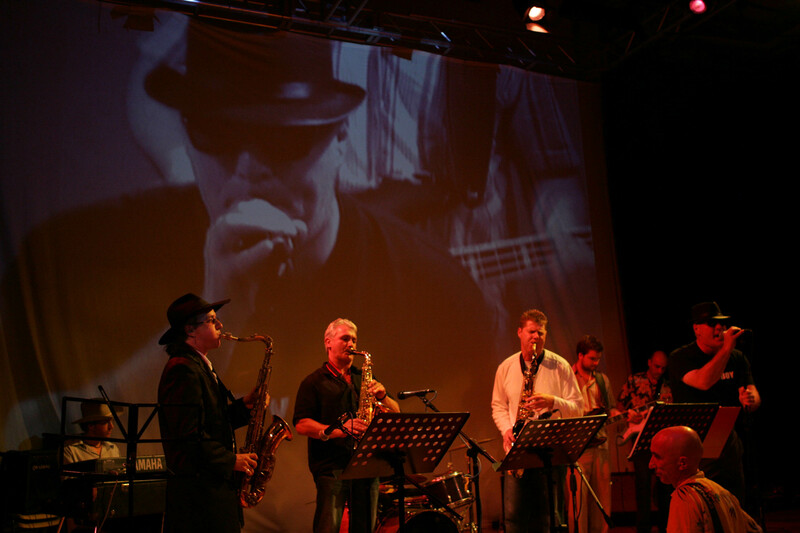 The bands in this vital and exciting addition to Baths music scene include line-ups to cover the full spectrum of music from the feel-good The Big Blowout Party Band, to the pop classics of The Baker Street Band, to the soul groove of Kingsize SoulSax Inc to the more relaxing vibes of Jazz Reggae or the Swing Specials and everything in between. Events they cover are Weddings, Birthday Parties, Balls, Corporate functions, Charity Events, Garden parties and Special Events. All the musicians are of the highest quality and feature the charismatic Mark Archer and/or Craig Crofton — renowned exponents of the sax who will make any occasion one that’s certain to be remembered and cherished by your guests. To complete the unique take of this new saxmobile 2012 you can see on each corner examples of the painted saxs by Cate Archer. They can be mounted on the wall as you would a canvas and placed wherever you wish. They look amazing in the home as an accessory to your interior designs and a wonderful talking point. They look amazing in the home as an accessory to your interior designs and a wonderful talking point. Some of the saxophones can have subtle lighting with the sax so that it projects soft light and colour through the various openings onto the surrounding wall. 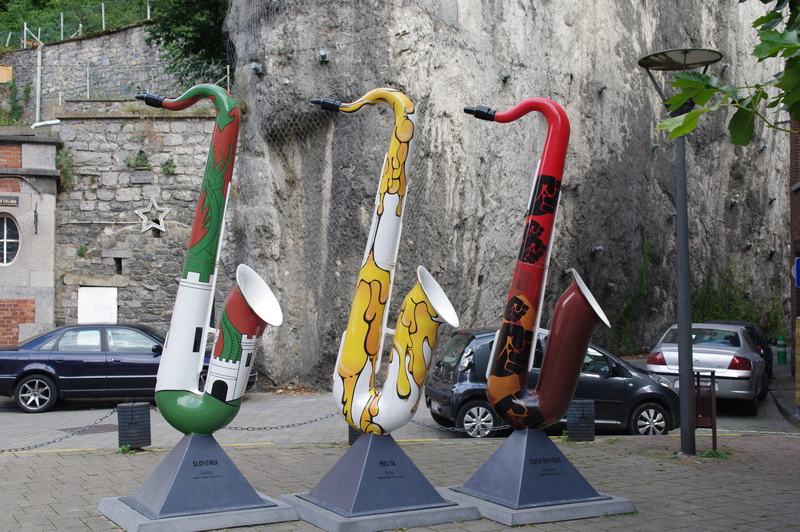 These fine art saxophone pieces can be used for hotel and restaurant interiors and displays. 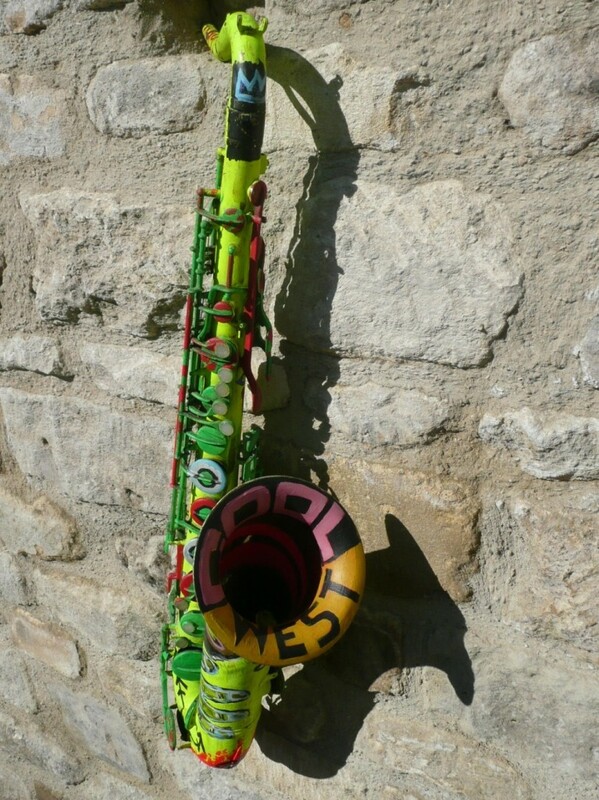 The painted saxophone spark a comment or a desire to own one from teenagers who think they are cool and how they would look in their bedroom in particular the graffiti style Music Man’s Dreams sax with those vibrant colours. Wild Cat is a female horn feline and its fur like in its influence. 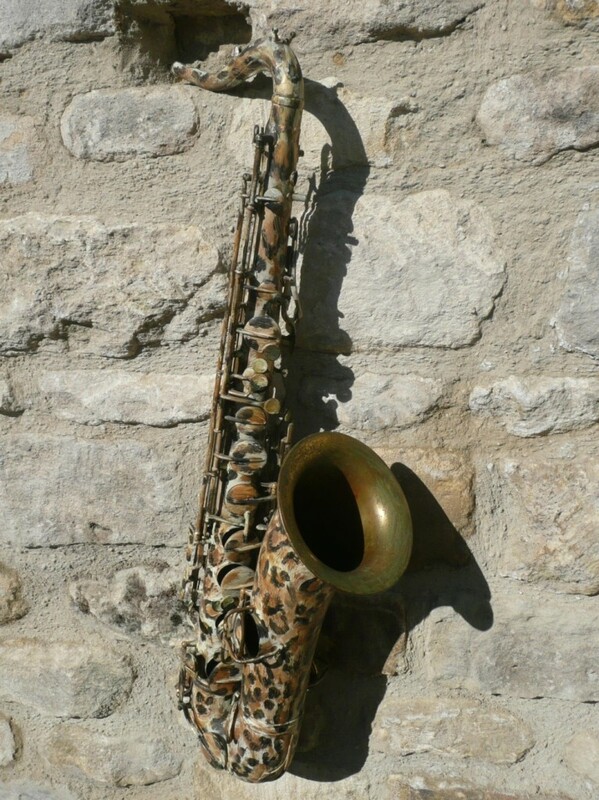 handpainted sax .This is a very tranquil piece.Its pattern is etched and scratched which allows some of the original metal from the tenor saxophone to glisten through. Also what an unusual gift for someone who loves the saxophone be it for the music or the sax itself. It is an unique way of expressing yourself with a piece of art you love. AND Finally after 17 long years The Blowout Sax teaching book ideal for beginners who don’t read music and want to learn the saxophone with a fast effective and fun approach is ready. 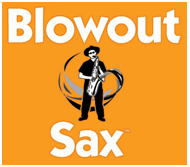 Go to www.blowoutsax.com for more details. 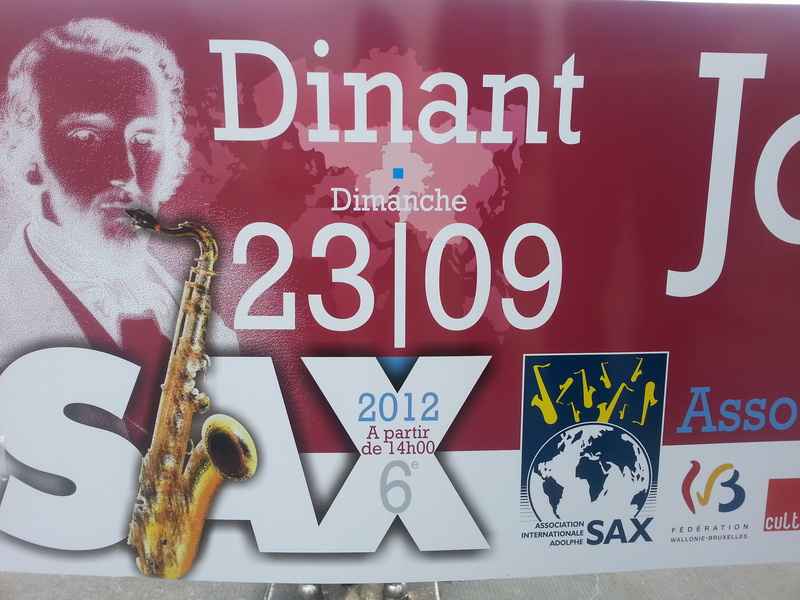 It’s a total joy driving the saxmobile 2012 and I hope many folk become aware of the saxophone and join us a Blowout Sax. Famous people who play or played the sax? 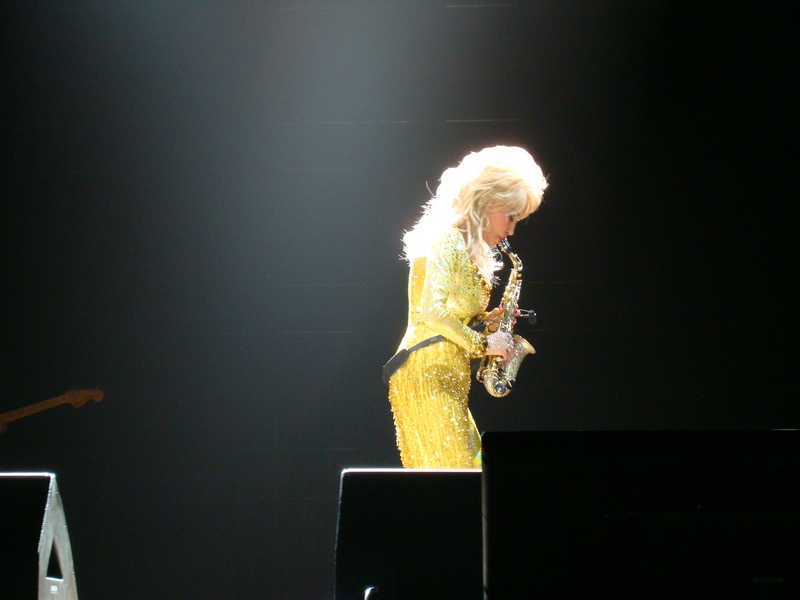 One of my lovely students Sally brought this photo in of the legendary Dolly Parton playing the soprano sax with a definite diamante feel? I had no idea she played..it got me thinking who else plays or played? DION DUBLIN..top saxman played on Ian Wright’s tv chat show a few years back..
ALISTAIR COOK..England cricket Captain and top run accumulator. a certain former US president BILL CLINTON?!. ZAC PURCHASE..he of distraught with his Olympic silver medal..
DAVID BOWIE…first instrument was the saxophone. one of my students years reckons he heard BB KING playing sax in the Cote D’Azur with similar phrasing to his guitar blues licks?? So if you know any more famous people please let us know?? 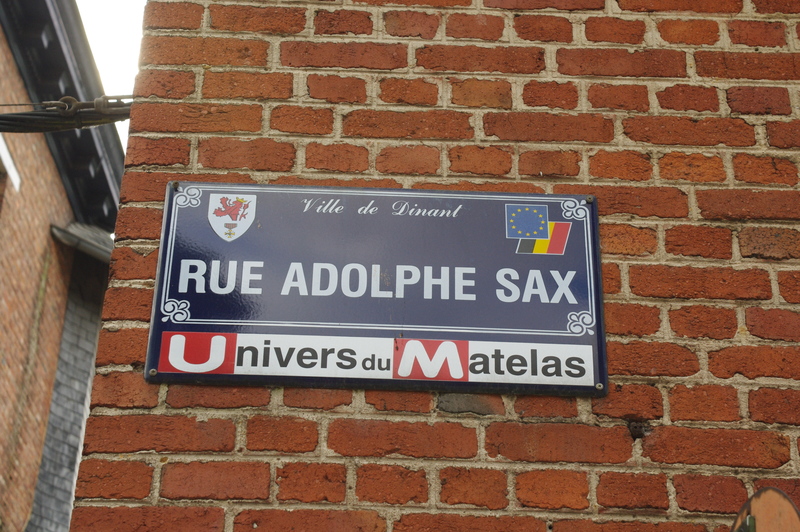 Early September 2012 many of the excellent characters that have made up the Blowout Sax School over the years visited the birthplace of Adolphe Sax while on a war tours of Belgium. The Blowout Saxmen in the party were Mr Julian Boswell ‘Mr Boz’ he of Will You solo on the Blowout Youtube channel ,Shaun Lawes aka ‘Sir Archie Splinter ‘ and the Jones Bros Paul and Kev. 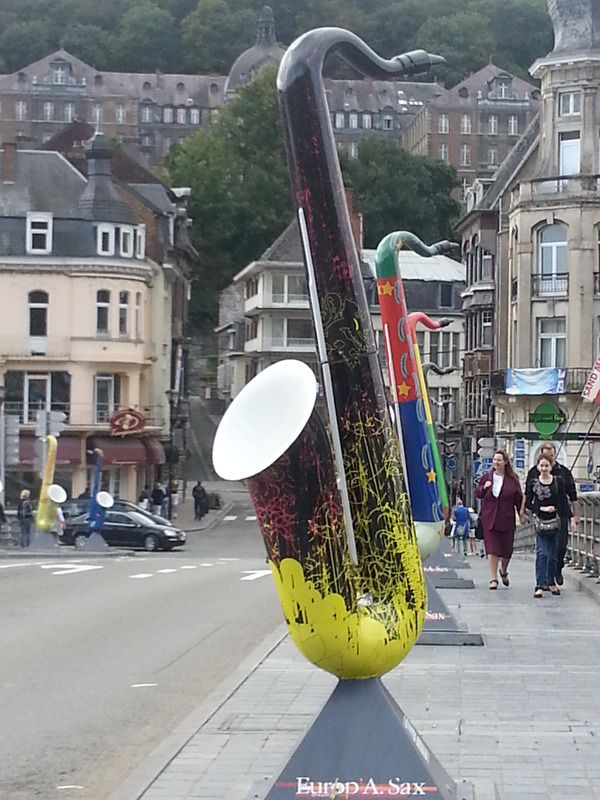 To start with there was his own road – Rue Adolphe Sax. 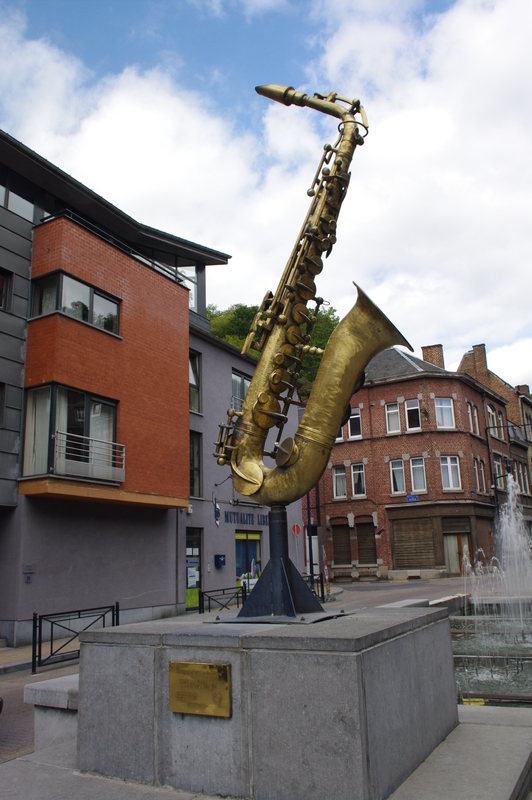 And what a stupendous saxophone outside the saxophone museum there. 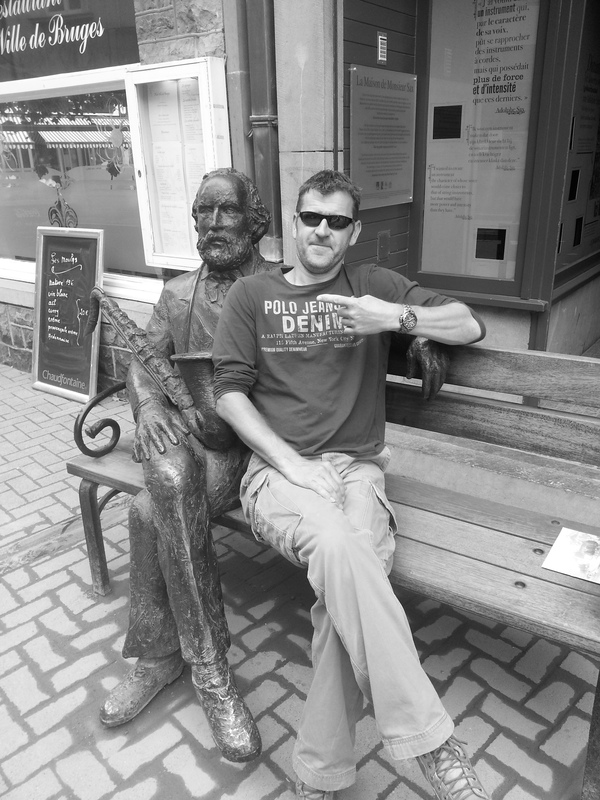 Mr Boz even met Adolphe Sax!! 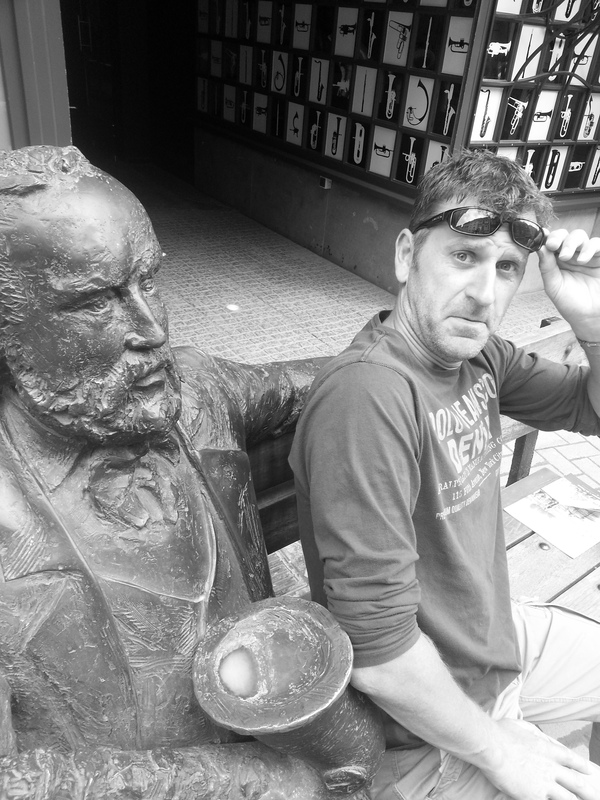 but had an unsure moment with the madcap inventor getting too friendly ! 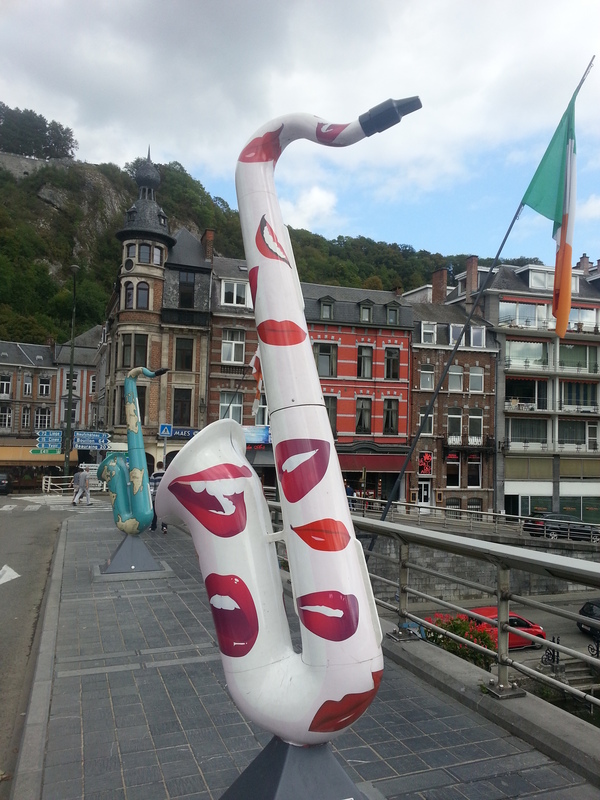 In Dinant there were some wacky variations on the saxophone??!! Even the bridges were adorned with saxs. 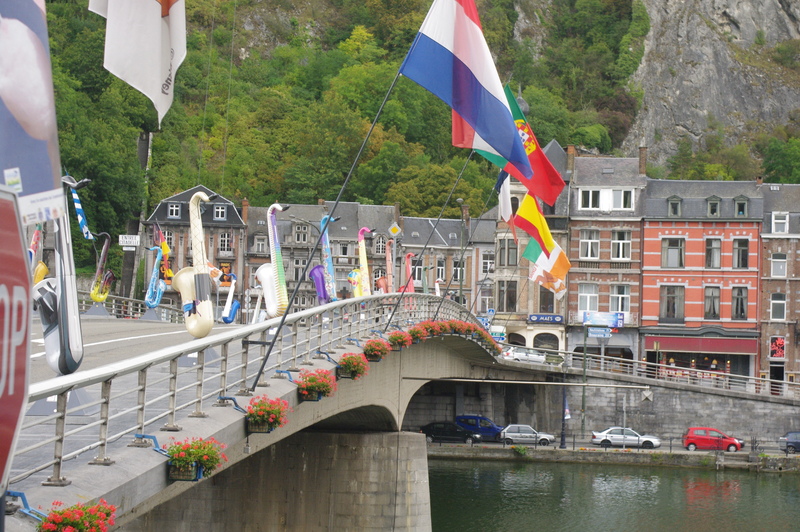 and finally Adolphe promoting the upcoming Dinant Jazz Festival. 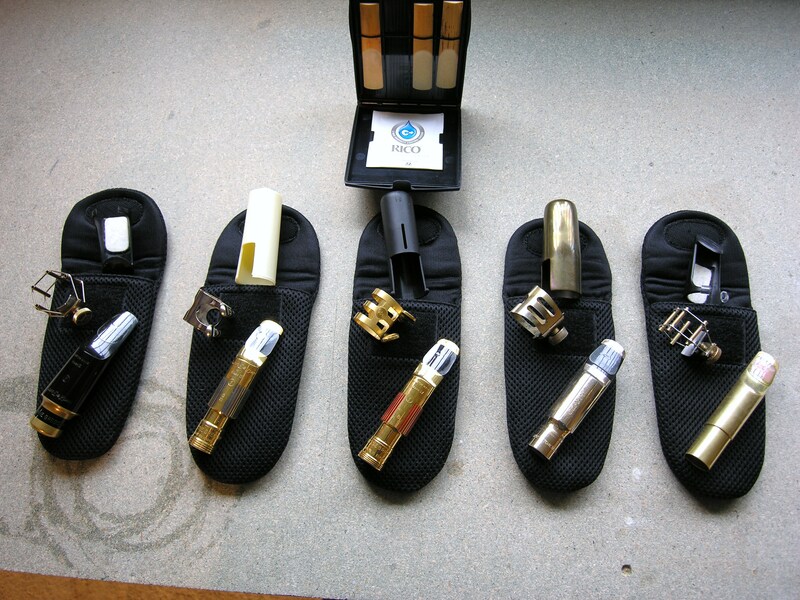 The Collection of Top Level Professional Tenor Sax Mouthpieces. One of our superkeen and very good Blowout Sax students who wishes for marital purposes wishes to remain Anonymous went on his quest to find his personal tone. He outlaid a small fortune on this collection of tenor sax mouthpieces which in time too will prove to be a clever investments. To solve the connundrum of which was the one for him we recorded him playing the same tune ‘Make Sure You’re Sure,'(a Joshua Redman take of the Stevie Wonder classic) and left it ‘wet’ ie with echo and ‘dry’ without. There are 5 different types here – an original Dave Guardala David Brecker model,a vintage metal Otto Link and three different Freddie Gregorys-mark 3 mark 4 and mark 5.All these were played on a vintage Mark VI Selmer. Have a listen and lets hope it can help you on your quest for your own personal sound and check out Mr Anonymous thoughts on the mouthpiece . Here’s Mr Anonymous take on the mouthpiece proceedings …. As you know, it’s been the first time I have heard myself in a true way on all of the pieces, and interestingly I have found my sound that I like with my chosen reed (Vandoran Java 2.5 ) and again, interestingly I sound more or less the same on them all. My Favourite (Just) The Mk 1 Vintage Hand made Dave Guardala Michael Brecker (GMB) with Pink bite Plate. They all have the famous faint hand markings on the shaft together with the number. These can be a brute at times and has a bit of resistance; It is the most difficult to tame and master; It has a fiercer high end that I love, its loud when pushed, and I have worked hard for around 4 years plus to get the low end sound right; The Journey is well worth it though. Out of all the mouthpieces, it’s the thinnest in width and takes some getting used to as your embrasure has to change to accommodate this profile. It has the most wonderful, almost `crude but refined` hand finished internal walls that are so thin, its unbelievable; The Hand filling on the Inside Lay is a trademark that is unique to the Dave Guardala Hand Made Original pieces. I use a `Francois Louis` Lig on this piece as I am a huge fan of them, they seem to keep the mouthpiece true to the sound, bright and are made in such a way not to `deaden` or muffle the tone, and once you master the technique of how to put the reed on with them, they are a breeze. VALUE, around £1,500.00 to £1,600.00 IF YOU CAN EVEN FIND THEM (Rarer Than HENS TEETH) Put your own price on it if you like!!!!!!! Second Up (and so so so close to the Guardala) is the Vintage Double Ring Florida Otto Link. This was originally a 5 Tip but has been Re Faced up to a modern 8 Tip (110) by the famous American Mouthpiece technician `Brian Powell` It has the Original Lig and metal cap that both fit like a glove. In Beautiful condition and rare to find one like this. I do have a Francois Louis Lig for it which makes it sound slightly brighter, but im happy to use the original Lig mostly. My Next Favourite Piece is the FREDDIE GREGORY VINTAGE MKIII CUSTOM MADE 8* Tip. The Lig is a Selmer and fits fine, but I do use the Correct `Freddie` Lig (as in the other pic on the MK IV) and it fits like a` Chickens Lip` (Bang On) He detests making the Ligs and so these are even refer!! Now `Freddies` Pieces are renowned to have a fantastic hand finish, and its very true, the work is incredible, he is an old man now and lives in Spain, he is still making them to order, but a waiting list of around a YEAR is still current!! They are in high demand. This Metal Mouthpiece has the extra Blue Flutes on the sides (an extra) and is DROP DEAD GORGEOUS, I could look all day at it (sad I know) It is Immaculate and has an amazing POWERFULL FREE BLOWING sound throughout the range that almost matches the GUARDALA (but not quite as edgy) , it can also `whisper` when you want it to, and Boy it puts a smile on my face when im up for the `Energy Rush` of blowing full on. It is and can be your permanent piece, just taming it for all registers at your sound level is the trick. Fourth Up Is the Next FREDDIE GREGORY VINTAGE MK IV CUSTOM MADE 8 Tip Again the Lig is the True Freddie Gregory as mentioned above, It has Red Coloured Flutes which means its an early `Freddie` Piece and was actually made in the UK when he was living here, Once again it is a masterpiece and is Immaculate, I have the famous Tube that Freddie sends them out in, so it’s the complete package. These MKIV are the most popular as they are the Ultimate All Rounder in Mouthpieces, they have that certain Tone that is Vintage, but bright when pushed, beautiful sound low down and so so easy to blow you could do it whilst asleep!!!!! So to speak. They are the safe bet if you only intend to buy ONE EXPENSIVE Mouthpiece. Lastly, HAVE YOU EVER SEEN A UNICORN? YOU HAVE NOW AND ITS IN THE SHAPE OF A Hard Rubber FREDDIE GREGORY VINTAGE MKII CUSTOM MADE 7 Tip (Otto Link Selmer) design. THIS IS THE RAREST FREDDIE IN EXISTENCE I use a Francois Louis Lig On This Beauty. It’s the only Hard Rubber Piece I have as I do tend to favour the Metal Pieces; However, This is so so so so so Rare and Beautiful I could marry it! HOWEVER, you might say, why is it your least favoured piece? Its Simple, I’m young at heart, relatively fit, have buckets of air to throw through my horn, I love the Edgy Sound of My Tenor. I’m saving it for when im around 65 to 70 so I can slowly enjoy the last years of blowing on a fabulous free sounding piece without having a heart attack!!!!!! VALUE. I WOULDN’T RAISE AN EYE BROW, EVEN IF I WAS OFFERED £3,000.00 FOR HER.